Oppo is a name that has been getting quite a bit of recognition in the past two years. They make high quality DVD players with an affordable price. Their latest is rather unique, it is designed to be a digital only solution. After the review, you may want to check out the blog postÂ onÂ HQV benchmarkingÂ theÂ Nvidia's GeForce 7-series video cards. The Oppo name might be unfamiliar to some, but to A/V enthusiasts their name is getting recognition. They have been shipping high quality upscaling DVD players for a while now. Their most recent models have been DVI or HDMIÂ equipped and come with a strong recommendation that the digital interface should be used. Oppo has designed the players for the full digital path, i.e.Â from the digital optical discÂ to theÂ digital display. Their last few models have also been Universal DVD players. To be a Universal DVD Player means that the player can playback every known type of DVD standard, be it DVD-R/RW or DVD Audio as well as SACD. Their newest model is the DV-981HD and takesÂ the natural evolution of Oppo's emphasis on digital only to HDMI 1.1; the 981 drops component video totally.Â With HDMI a single cable of pure digitalÂ dataÂ is all that is needed for all of the mentioned formats above. HDMI has the bandwidth to pass the high resolution audio found on DVD Audio and SACD in addition to theÂ compressed audio formats (Dolby Digital or DTS) found on DVD Video. HDMI also means the capability for 1080p output. Most upscaling DVD players (and certainly those in the Oppo's price range) top out at 1080i, meaning brand new 1080p HDTV owners still need their TV's video processor to deinterlace the 1080i signal from the DVD player. Oppo goes one better and includes the whole gamut of ED to HD resolutions — 480p/720p/1080i/1080p. Accessories included: Power Cable, Remote and batteries, Manual, HDMI cable, Stereo audio cable, composite video cable. Oppo's previous players haveÂ only beenÂ available in silver, this new player is only available in black, which I think is a smart move –Â black A/V components are plentiful. The player physicallyÂ is thin, much thinner then the older DVD players I've been used to (IÂ changed to aÂ home theater PCÂ and haven't owned a set-top DVD player in years). The remote is useable, perhaps not the coolest looking remote, but quite functional. The CD/DVD tray is on the thin side but seems durable enough, Oppo points out that this is by design and is made to withstand someone bumping into it, etc. The user manual does a good job of explaining the various connection options –Â it even reminds the user that the S/PDIF ports can't transfer the audio from DVD-A or SACD so using the optical/coaxial port isn't the best option. It correctly tells the consumer that the best connection to use is HDMI and barring HDMI the analog 5.1 outputsÂ are preferred.Â Likewise it reminds the consumer that the s-video/composite video ports areÂ included moreÂ for troubleshooting a video connection and are not recommended for normal use because the player providesÂ noÂ scaling or processing from the 480i outputs. Because of all the functionality required to be a Universal DVD Player plus play DivX movies burned to CD/DVDÂ theÂ OppoÂ has a slight boot-up time, however it is nothing like a Blu-ray or HD DVD player. It takes about 15 seconds to get to the welcome screen. Putting in a DVD results in about a 5 second wait as the video plays. This is certainly acceptable wait time and much better then manyÂ lesser featured 480i/pÂ DVD Video-onlyÂ players I've used. The firmware is also upgradeable via CD-R. Oppo has been very good with older models, fixing various issues and tweaking values in firmware updates. When playing, the unit's bright readable VFD shows the status such as open/close/reading, the time index, plus various small logos that light up when Dolby Digital or DTS is active. There is no noise to speak of when in use, as there aren't any fans that would cause noise. Layer changes were often jarring on older DVD players, IÂ used an old Toshiba DVD player made circa 2000 and the changesÂ were just painful. The Oppo smartly has a larger buffer and thusÂ buffers ahead of the layer change making it unnoticeable. Since the Oppo is a universal DVD player it must be able to playback audio that goes well beyond the DVD Video specifications. DVD Audio and SACD have much higher birate and sample frequency audio. This means S/PDIF is out of the running. HDMI is the preferred audio transport. However most people still don't have a proper HDMI 1.1 or newerÂ enabled surround sound receiver in their home theater as of yet. Knowing this Oppo went the extra mile and includes a full set of discrete 6-channel (5.1) analog outputs, which is the only other way DVD-A or SACD can be output. Oppo doesn't leave standard DVD users hanging either, the unit includes both Dolby Digital and DTS decoders so that the analog 5.1 output is all you needÂ to connectÂ to your home theater. Major Kudos go to Oppo for including not only a full featuredÂ Dolby Digital but DTS decoder as well. I was not able to test the 5.1 analog outputs but the S/PDIF port passed everything as expected.Â The 2-channel analog output worked very well. Thanks to the included DTS decoder it is possible to choose the DTS sound track from a DVDÂ even when using onlyÂ the stereo audio output. Oppo has a fairly convincing virtual surround sound modeÂ when using aÂ 2-channel setup. If your stereo equipment supports Dolby ProLogic it can send aÂ compatible downmix. As noted above the only video output of real valueÂ is the HDMI output, component video output has been removed. For those with older DVI equipment, the only requirement is that your display's DVI port have HDCP (as HDMI includes HDCP). Older TV users should be happy to know that I tested this on my personal CRT HDTV which was manufacturedÂ in 2003Â it has a DVI (with HDCP) port and it worked just fine, I never had any handshaking issues. The Matrix — TheÂ Lobby Scene: Who doesn't love thisÂ film? The lobby shooting spree is anÂ awesome action sequence that has lots ofÂ debris flying. AndÂ as I found out, the marble makes a good spot to check for macroblockÂ errors. Star Trek Insurrection — around 34:22 in to the filmÂ is a scene where the camera circles Picard, Data, andÂ Anij. This motion can be pretty hard to keep smooth. Swingers (Miramax collectors series) — Great movie, great DVD transfer, a bit noisy, a bit grainy thanks to the indie film roots. Good test to see how the noise reduction works, it should reduce the digital video noise a bit but not smear out the inherent film grain. Star Wars Episode III Revenge of the Sith — Naturally one of the best "reference DVDs" around thanks to being shot in 1080p digital video. If a DVD player manages to mangle this one, there is something wrong. These two modes looked amazing, the colors and detail from most DVDs just jumped right out. Just about any DVD I put in looked very good. The Oppo gave my HTPC a run for its' money, I actually liked the Oppo's output slightly better, aside from the macroblocking issue IÂ explain in the sidebar below. The 480p mode I found to be fairly good, but not spectacular, 480p just isn't "where it's at", which is fine by me, this is an upscaling player after all. My HTPC I feel did just a little better at 480p then the Oppo, but I find 480p to be coarse no matter the player. IÂ recommend that EDTV plasma displayÂ owners set theÂ Oppo for 720p and let your display scale it back down to 480p. There is one downside to the otherwise excellent Faroudja video-processing chip the Oppo 981 uses: it tends to exagererate MPEG2's macroblocks. Macroblocking looks like patches ofÂ off-color blocks,Â typically seen on background walls and floors, in mist, and in scene fades. The good news is that on my calibrated HDTV I didn't see the errors much, the one time I saw it was while watching the Lobby Scene in The Matrix, the marble tile had sort odd yellowish tinge to it. Switching to my HTPC, no such issues. HQV Benchmark — If you haven't heard of Silicon Optix or their HQV Benchmark you've been living under an A/V rock. Silicon Optix is a vendor of very advanced video processing chips, they made a demo DVD of torture tests to show off their video processing chips. The tests were refined and made into a commercial DVD for anyone to benchmark with. These tests reveal just how well a player's video chip does with things like deinterlacing, noise reduction, 3:2 pulldown, and nearly every kind of cadence under the sun, including exotic ones like 6:4 and 8:7 which are often used in Anime. The score is out of 130 possible points. I am not aware of any shipping product that can actually score a perfect 130. The player's video settings were left at the factory defaults aside from Noise Reduction being set to 'Medium' to acceptably pass the noise reduction tests. In a proper HD resolution the Oppo is an amazing player, especially considering the price tag. It gets an excellent score of 125. The only missing points are 5/10 points for the 3:2 detection (film detail) test. This is not aÂ failure, it just took slightly longer then ideal to lock on to the film mode. HQV's critera for ideal is very harsh, a 10 means the 3:2 mode is detected in under 1/20th ofÂ a second. TheÂ Oppo took about 1/2 a second, hardly an issue for us end users, but for the benchmark it means -5 points. The test here were quite good, but fell just a hair short of the HD resolution testing. It has a score of 118 in 480p. The deinterlacing in the second "jaggies" test was slightly worse then in an HD resolution so it gets a 3/5 in that test under 480p. Likewise the Flag waving test seemed to be a bit worse earning a 5/10 in 480p. For a comparison: my testing of GeForce 7-series cards with the latest PureVideo Decoder and ForceWare drivers results in a score of 123.Â NVIDIA claims theÂ GeForce 8-seriesÂ scores an astounding 128. For more details on my findings with the GeForce 7-series see my blog entry which has some interestingÂ software setup notes for NVIDIAÂ HTPC users. The output of the Oppo is generally nothing short of spectacular, with a recent well mastered DVD one really can sit back and almost forget that this isn't actually high definition, just a good fakery. 1080p native upconversion is a boon to all the influx of new 1080p TV owners that are sure to come as the prices plummetÂ during 2007. The fact that the player can play just about any optical media (short of the next gen formats) is a major plus for anyone looking to unify their various devices. The only negative is the macroblocking issue. However, this is dependant on the content and even the calibration of the display being used.Â Most people wouldn't even notice it. This would be an incredible value for anyone who wants a single unit to handle all their DVD collection and doesn't want to mess with multiple devices or an HTPC. I personally can see recommending this to more then a few people I know who bought an HDTV set for Christmas, have older 480i/p only players,Â and are wondering how to get the most out of their movie collection. 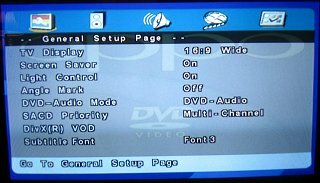 Oppo even has a very good article about why a good quality upconverting DVD player is crucial in the new HD world called "Getting the Most out of DVD on an HDTV Display."